Saudi Arabia-based Sabic, a global leader in the chemical industry, has announced the launch of AMS31F filament, the company’s breakaway support material for fused deposition modelling. The new filament maintains rigidity during printing and provides exceptional pliability during post processing to enable easier removal of scaffolding at room temperature, which can help reduce the time required to produce finished parts. The new AMS31F filament is for use with Sabic’s ULTEM AM9085F filament, a high-performance polyetherimide (PEI) material that provides high heat resistance and mechanical strength which are optimal properties for potential aerospace applications, as well as for automotive, oil and gas and tooling applications. “Using structural supports to print parts with complex geometries is essential, but it can also be quite challenging,” said Keith Cox, senior business manager, Additive Manufacturing, Sabic. Sabic’s new AMS31F filament helps part producers increase their productivity by helping to reduce the time required to remove structural supports. Sabic’s patent pending material formulation was developed for use with ULTEM AM9085F filament to balance excellent adhesion during printing with the ability to easily remove the scaffolding during post processing. Unlike competitive support materials that often require reheating to facilitate removal, Sabic’s AMS31F filament easily separates at room temperature, reducing post-production time. The filament’s white colour provides a sharp contrast to the amber colour of ULTEM filament, which allows operators to more quickly identify the structures to be removed. 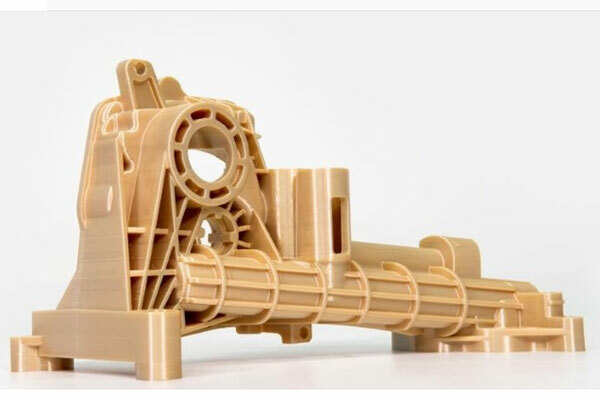 “The adhesion between the ULTEM AM9085F filament and Sabic’s new AMS31F support filament is excellent at high temperatures and detaches easily at room temperature, eliminating the need to reheat parts,” said Davide Ardizzoia, chief executive officer of 3ntr, an additive manufacturing system company in Oleggio, Italy. Often the print direction chosen by operators is aimed at reducing structural support to minimize post- processing time and may not be optimal for the mechanical performance of the part. The ease of removing the AMS31F support filament gives the operator greater latitude in defining part orientation that is better suited to optimize printing efficiency and part performance. By expanding design freedom and accelerating the support material removal process, Sabic’s new AMS31F filament adds to the value of using ULTEM AM9085F filament in demanding applications. High-performance ULTEM filament is made from Sabic’s proprietary ULTEM resin (PEI) technology. It provides high heat resistance and mechanical strength, is UL 94 V-0 compliant at 1.5- and 3.0-mm thicknesses and meets FAR 25.853 and OSU 55/55 requirements with low flame, smoke and toxicity evolution. ULTEM AM9085F filament offers excellent diameter consistency to help meet customers’ dimensional specifications. Sabic’s filaments are continuously monitored with a laser micrometer to help ensure adherence to stringent specifications for diameter consistency.